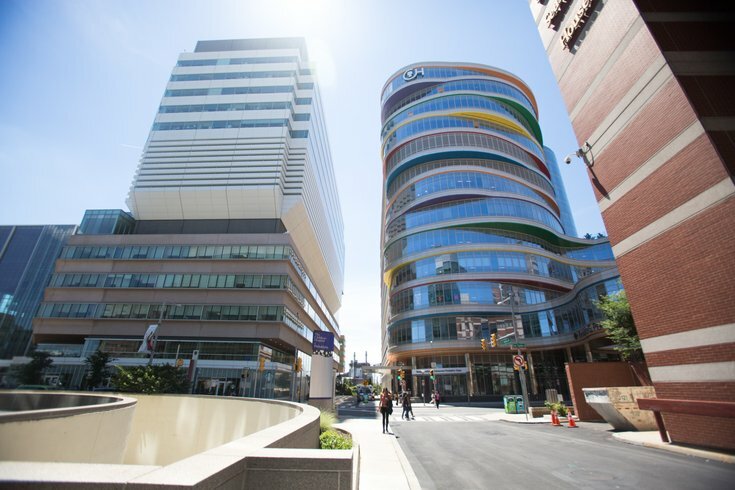 The Smilow Center for Translational Research, left, and the Children's Hospital of Philadelphia's Buerger Center for Advanced Pediatric Care. Researchers at Penn’s Perelman School of Medicine have identified a new target for the treatment of melanoma, helping to paint a clearer picture of what conditions can improve or worsen the condition – and how it could be more effectively treated. For women, the relationship between child-rearing and melanoma, like several other cancers, has remained a questionable variable. Previous studies have claimed that pregnancy worsens a woman’s risk for the skin cancer (a claim that has since been refuted), while other research associates history of pregnancy as an advantage in fighting the illness. Now Penn researchers have identified why pregnancy may play a role in a person’s ability to survive the most dangerous form of skin cancer. Located on bottom-layer, pigment-producing skin cells is the GPER (“G protein-coupled estrogen receptor”), a cellular protein that’s activated by estrogen. Using mouse cancer models, Penn researchers activated the GPER region for treatment. The result: half of all animal tumors were eliminated completely, while 100 percent of the animals now had extended survival. The important role of estrogen – which is far more common in women than men, and even more so in pregnant women – in activating GPER sheds much light on why melanoma survival tends to favor females. “In melanoma and many other types of cancer, women have a better prognosis than men, and women with a history of pregnancy seem to have a better prognosis than those women that have never been pregnant,” said Todd W. Ridky, Ph.D., in a statement. Ridky, an assistant dermatology professor at Penn, acted as senior author on the study. With GPER activated, cancer cells divide less frequently and make it more difficult for the cancer to resist immunotherapy treatment. Though no drugs currently target GPER specifically, the Penn researchers used a lab compound on the mice, as well as an anti-PD-1 inhibitor. Ridky said just the inhibitor alone would not have been enough to see the positive results the study concluded. Before the treatment can move on to human testing, the researchers will continue testing mice and checking for any toxicity in the lab compound.